Barbara Cleverly was born in the north of England and is a graduate of Durham University. A former teacher, she has spent her working life in Cambridgeshire and Suffolk; she now lives in Cambridge. She is the author of thirteen books in the Joe Sandilands series, including The Last Kashmiri Rose, The Blood Royal, Not My Blood, A Spider in the Cup, Enter Pale Death, and Diana’s Altar. "Charmingly old-fashioned . . . Cleverly resolves the mystery with her customary expertise and good taste. But she's human enough to take the occasional jab at men who make the rules of society, 'smothering female talent, gagging and belittling their wives and daughters.'" "The inspector’s earnestness is well-tempered by a good deal of wit and charm. And Ms. Cleverly displays a sure knowledge of the personal attitudes, social conditions, science and slang of a fascinating transitional period in history." "Cleverly, known for the intricate puzzles she creates and the depth with which she draws her sleuths, has another winner in Redfyre. With dry humor to leaven a frightening story, richly imagined characters and a sure sense of place and time, she leaves the reader eager for Redfyre’s next case." "I enjoyed the excellent writing, the careful placement in time and place, and strong pacing." "In this new series kickoff, Cleverly provides the requisite period detail, adds a cunning mystery, and acknowledges that the fight for equality continues to this day." "A brilliant sleuth with surprisingly liberal politics for the time, Redfyre combines the wit and willingness to defy convention of Kerry Greenwood’s Phryne Fisher with the polish of Dorothy Sayers’ Lord Peter Wimsey, adding a hint of G. M. Malliet’s Max Tudor. The novel has the feel of a humorous cozy while exploring serious themes and boasting richly flawed characters . . . a promising new series." "Aficionados of Jacqueline Winspear and Dorothy Sayers will relish this atmospheric historical mystery, with its colorful period details that brilliantly capture post–World War I Britain." "Excellent historical detail, humorous dialogue, intriguing characters, and a whodunit that will keep readers on the end of their seat until the very end." "Simply stellar . . . Reaches back to the works of P.G. Wodehouse and the great mystery writers of his time, but is written in such a way that the present-day reader can be totally engaged." 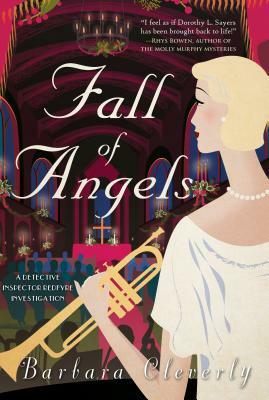 "Fall of Angels provides a wide cast of smart women." "Cleverly’s scene setting is vivid and skillful." "I have been a fan of Barbara Cleverly's ever since her first Joe Sandilands novel, and find her new series quite exciting. I feel as if Dorothy Sayers has been brought back to life! Detective Inspector John Redfyre is Lord Peter Wimsey without the affectations. Many writers can tell us about the 1920s, but so few can transport us there, as Barbara Cleverly does." "Imagine Lord Peter Wimsey attended Cambridge instead of Oxford, and needed a job of work to support himself. And there you have it, Inspector Redfyre, a toff as adept at detection as he is at wordplay. Fall of Angels is sharp, witty, and pleasingly surprising."